In the week gone by, we saw Nifty break out of the uncertain triangle formation and move up..Technically we see the last leg c of c now unfolding. This week we may see completion of this c leg. Last week we were watching to see whether Nifty would resist at 61.8%. Nifty with a gap up climbed above this level, and is now within striking distance of 76.8% retracement levels.Since we had seen a Limiting triangle formation last week, the expected target of break out is 75% of the largest wave inside the triangle. Since a was the largest wave and it measured 335 points, our limiting triangle target is around 6056, which is quite close to the 76.8% retracement levels also. 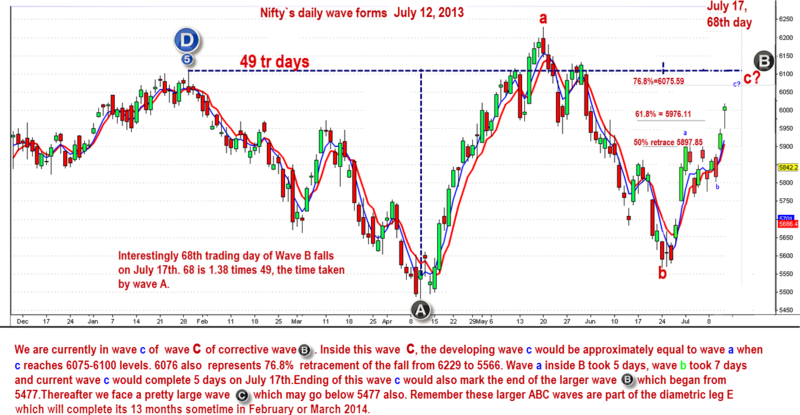 Timewise wave a had taken 5 days, wave b 7 days and the developing wave c will complete 5 days on July 17. 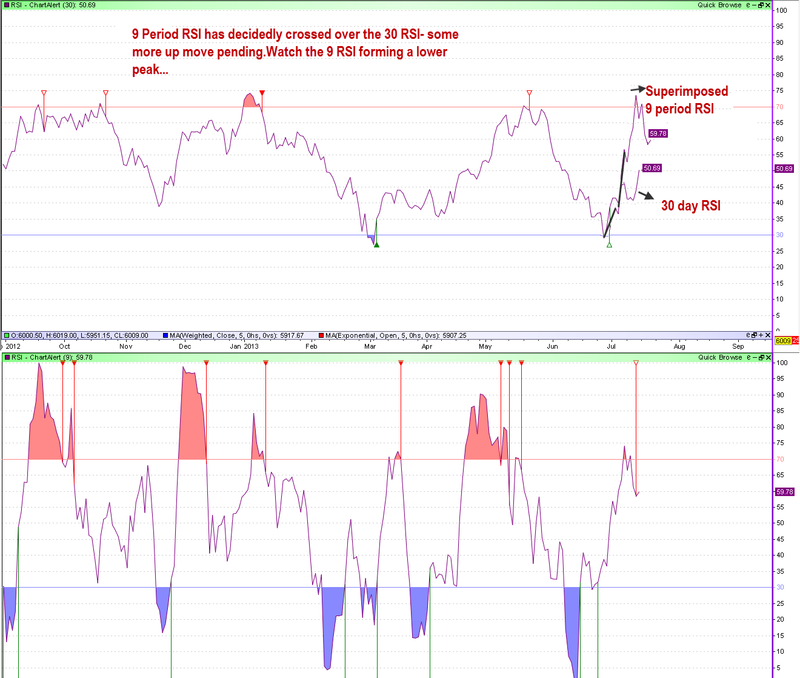 If we examine the RSIs we see that the 9 day RSI has substantially moved up over the 30 day RSI. This may be taken as a bullish development. Now of interest is the subsequent development of 30 RSI and whether the 9 period RSI will make a secondary peak.That could signify a crest. In the 60 min chart also we see levels of 6050 to 6100 are quite significant. 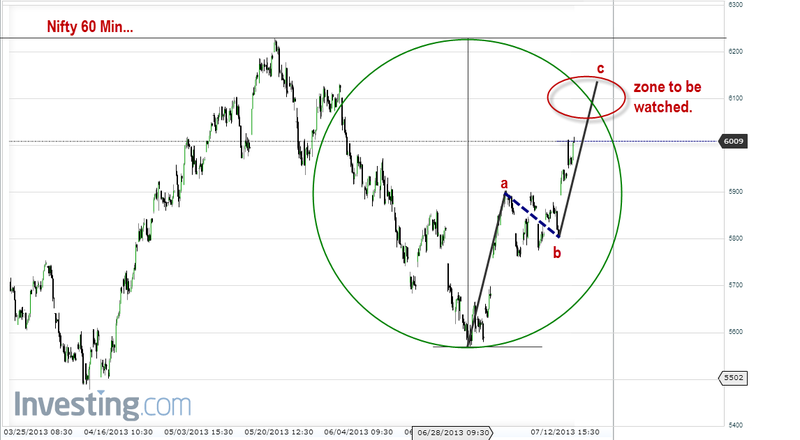 If Nifty vaults over these, then we are in powerful up market. Short term cycle suggests that the uptrend may be over around 6100 levels. approaching grand trine of Jupiter-Neptune-Saturn.Mid period of the current Venus Antara Jupiter Sookshma also falls sometime around July 22. So the period July 17 to 22 make be watched for a crest formation. If you had regularly followed the posts, we had dealt elaborately at different times in the past, on these long term formations. 1.On May 30, 2013, Jupiter enters Gemini. We had postulated that the long term uptrend is in danger and that for the next one year, we will see dual trend with a downward bias.This means that after the crest formation immediately Nifty may go down below 5477 levels also. 2.Saturn Neptune Trine:May 12 to July 27, 2013.While the central time band is June 20, 2013, we are seeing the positive distortion effects of Jupiter also joining the trine. Which means the central time band gets shifted closer to the Jupiter-Neptune-Saturn trine. This is around July 17. So between July 17 to 27, this trine should take its effect. Already we find euphoric reactions to developments such as Infosys results.We also note that crest formations due to this combination has a long term effect of one to two years. 3.Jupiter square Uranus square Pluto:August 06, 2013:We saw the waxing square of Uranus and Pluto was in vogue for 72 days from April 18 to June 28.Central time band for this formation was May 20 to 24. Nifty had made a high of 6229.45 on May 20 which remains the highest crest this year so far.When Jupiter joins the square, it could lead to bankruptcy issues around the world which could be the cause of the expected downtrend. So in a nutsheel, we currently play out the positiveness caused by the Grand Trine and then wait for negativity to set in, when Pluto,Uranus and Jupiter get involved in a square formation.We continue to hold Nifty and at the first hint of trouble in Nifty, we sell off and switch to shorts later, once the Grand Trine is over. If short term planet involved in a square formation nagative for day trading ?? Not necessarily. Three planets necessarily need to be involved. Third planet is the trigger.Also if there are bigger aspects involving larger planets we must see it that context. Iam first trying to understand for positional trades. Intra day trading is more complex and needs more research.Ideally the star positions and sub positions should guide us in intra day trading. There also there are exceptions which need to be understood more. What will be the effect of MARS-SAT-NEPTUNE Trine and Mars-Jupiter conjunction falling in the same week. Since Jupiter is involved along with Neptune, the effect will be positive and negative.Interestingly all three planets, Mars, Saturn and Neptune are in Rahu star. So this trine has a powerful Rahu effect.Now till July 21, Rahu is in Jupiter star, which is positive.Exact trines happen on July 17th.Post July 21, when Mars and Jupiter become conjunct, look for a negative trend to develop. I always consider 2 * as effective orbs. In the case of Saturn and Neptune trine, the effective period is from May 12 to August 19.Mid period is by 50 days, which is July 01. I had taken a 10 day orb on either side. But is happening is that like in vectors, when two forces are operating and when a third force is applied, it skews the energy make up of first two fields, when Saturn and Neptune are operating in a trine, then possibly the energy field of Jupiter will throw the first trine off balance.So the cycle could form a reversal after July 17. We have to wait and see. That is where we look at other culminating aspects. It is the same principle behind market cycles. In fact I suspect that the market cycles operate as per the planetary cycles.Always look for a third planet to translate the energies more fully.One more factor is this time we are not having 3 planetary trines, but four.Mars also joins the Grand Trine. Regarding separating and applying aspects, sometimes the cycles culminate before the exact aspect and sometimes after the aspect. Here again the principles of other planetary involvement seem to work. This much Iam sure. Aspects definitely have an effect. The exact trigger point is a matter of observation and research. Possibly other factors such as lunar movement or stellar positions need to be correlated. Thank you for your kind words. The purpose of this blog is to put forth my observations in a manner which will make others also see what I see, and TAKE IT FURTHER.My intention is not just to predict. In fact, I do not predict. I only forecast. The conceptual approach involved in technical analysis and in Financial Astrology are the same. Both involve pattern recognition which play out again and again in the market.Both the market and the planets are timeless. They are forever. Over time if we can isolate or distinguish specific patterns, which tend to occur again and again, then we can formulate simple trading strategies which help us make money. 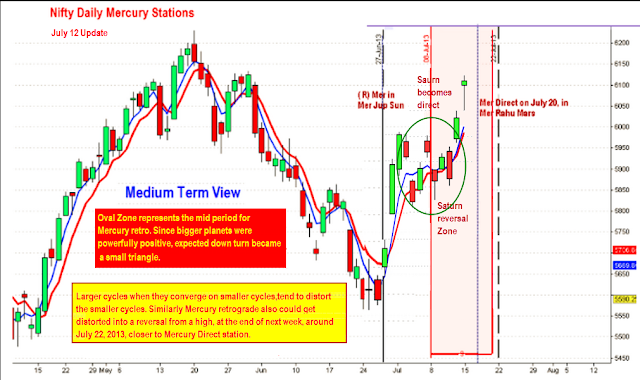 You can see how Technical Analysis and Financial Astrology compliment each other here. Financial Astrology as a whole can become a leading indicator for Technical Analysis and give us more assurance on the market movements in the immediate future.Regarding tutorials, I am sorry for the delays. Iam finding it difficult to allocate time for this. Hopefully I should be able to continue in the near future. please don't quit; as you know you are doing God's work at the same time by sharing your knowledge of one of the most divine things on this planet that is available to mankind and God gave you that knowledge to interpret it correctly and you share that with people who does not know ; some may use it for some gains while many would like to know what and how it will or may happen and you making it possible to know by putting forth on this site and please please please keep that up.